• 9 hole 3000yd Par 35 golf course. • Floodlit covered driving range. • Two practice putting and chipping greens. • 19th hole cafeteria for refreshments. • Full facility golf Professional shop. 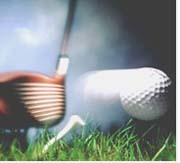 • Golf tuition Teaching Academy. However it's not just golf - enjoy a snack and a cuppa in the clubhouse, view the wildlife, and animals on our adjacent farm, and take a stroll to the Hayling beach and watch the yacht's racing. Located only 10 minutes from the main A3/M27 road junction, we offer a tranquil location with views to the sea and downs, excellent facilities, a warm welcome, value for money, and great golf.